I found Brimstone Coven's album discography rather confusing. There's their self-titled EP, which was almost a full album in its own right, a second album titled II, and now Metal Blade has released a new, third album -- also self-titled, and containing all the EP's tracks as bonus tracks. This last one is a fairly solid effort, consisting of doomy retro rock that sounds like it would have been perfectly at home in the early 70s. One can have a fair idea of what the sound is like just from that description. Guitarist Corey Roth's distortion is fat and overdriven with that tube-amp sound, and there is a psychedelic feel to the whole album that calls to mind late 60s acts like Cream. The lyrics are occult and name-check cosmic mysteries (and, of course, Satan) without being overt, a throwback to a time when Satanic lyrics were potentially shocking. While Cosmic Communion is snappy and has a good backing riff to it, I wasn't a big fan of "Big John" Williams' soft harmonies on the chorus, which fits with the musical style but didn't seem to work very well on this track. Behold, the Annunaki is catchier and speeds up at the end to give the song more energy, while The Black Door hypnotically pounds the listener with a blunt sound filed with a spacey ethereality, making it one of my favorites. Williams' voice is not extremely versatile, but it's full and clean and doesn't try to sound like past doom metal greats. There are plenty of chances to do such a thing on this album, but the temptation is successfully resisted, though The Grave does show the band's Pentagram influence. The production is well-made and clean, and the excellent riffs show up nicely on tracks that would fall apart without that clarity. The longest track, The Folly of Faust, is also the one that gets the most doom metal treatment. It paces slowly but inexorably towards its conclusion, with echoing little solos in the background and sorrowful-sounding vocals. The bass stands out more on this track during the instrumental break, too, though the guitar is always front and center in this song. 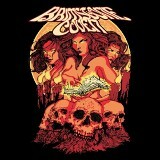 On to the bonus tracks from the first EP, and it's clear that Brimstone Coven has gotten better since then. We Are Forever is sung slightly out of tune with the guitar and its psychedelic beauty is spoiled by that, but The Ancients is better due to the soloing and Williams' not trying to depart from his vocal range this time. Son of the Morning and Lost in the Odyssey are listenable and Williams' vocals on these are quite good, but there is so much quiet suspense on these tracks that I almost fell asleep. Children of the Sun, on the other hand, speeds up more and simply has more interesting guitar work. For those who don't like retro music, none of this review is going to be a very convincing pitch to go buy the album. But Brimstone Coven is overall good, and those who like acts that have a retro feel and a sound that is more rock than metal, like Ghost or Jex Thoth, are likely to enjoy this.